I noticed the clouds on my first day in Northern India, as I always do. I’ve said this every time I have returned from travels, my cloud fixation reignited immediately upon landing. Light and airy, the clouds still had heft, their bottoms flat and tops puffed outward, tumbling layers of white. After the wide open skies of India and Bangkok, Montreal clouds appeared to hang by a thread, as though they would at any point come careening down, flattening me. Rationally, I knew that clouds don’t crash. But in the haze of jetlag, my face pressed to the window on the drive back to my parents’ place, I had my doubts. 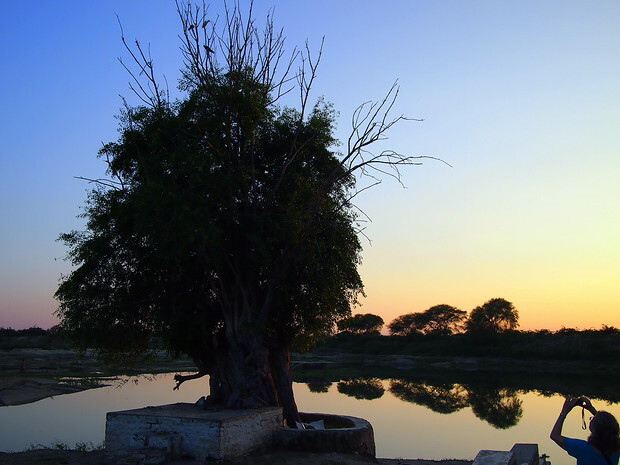 Before I left for India, those who had been said the same thing to me: it will be a place that you love and you hate, that you will find chaotic and dizzying and that will leave its imprint on you for years to come. 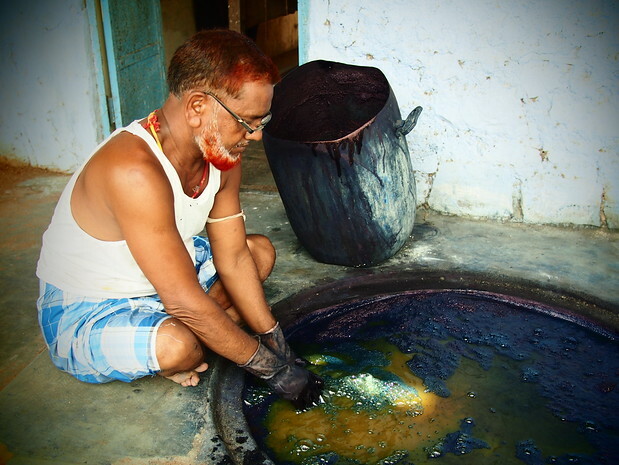 With many years of travel under my belt, I was curious about India’s effects. I remember how scared I was to leave for Santiago in 2008, and again how foreign Southeast Asia felt to me when I first set foot in Thailand near the end of that same year. How would I react to the dichotomies of India? 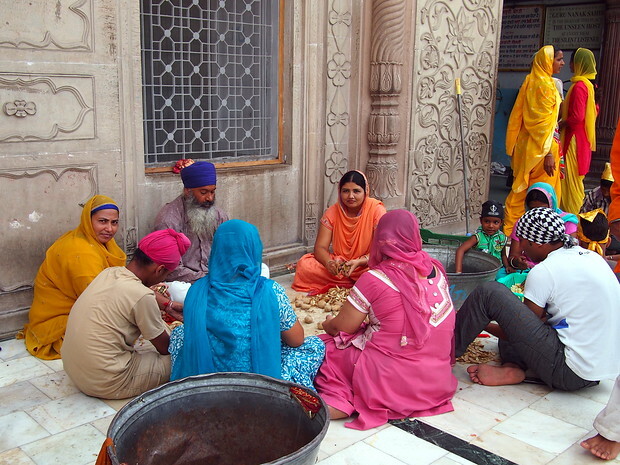 I am still processing how I want to share stories from Northern India on this site. But I want to start with a long umbrella post, an overview of the quirks that made me smile and the memories that lingered. Think of it as a follow up to the pre-trip reading and notes from just prior to my departure. The great, mostly — and bit of the ugly. Some not specific to India, but to developing countries generally. Others very much an Indian phenomenon. I can’t say I know India well at all — for starters, I travelled only to Rajasthan and Agra and Delhi. And with only two weeks and change, I had barely a chance to dig for anything all. In those few weeks, however, these are the things that stood out. 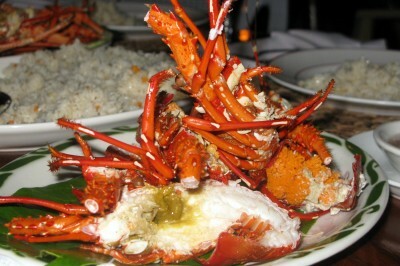 Every province of India has different dishes and culinary traditions. 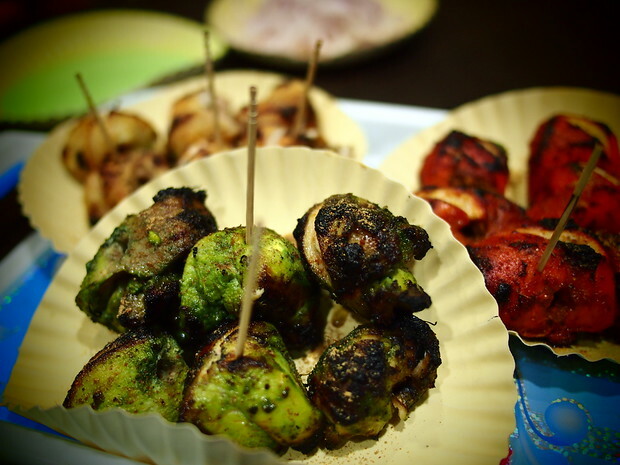 Punjabi food versus Rajasthani food versus Bengali food — so many variations of spice and taste and preparation. 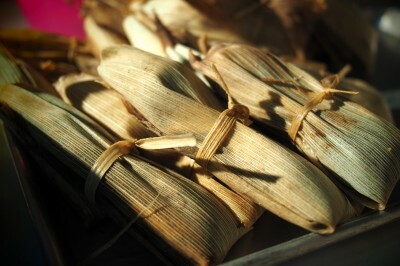 Much like China and other countries spread over such a staggeringly large geographic landscape, local specialities abound. So much food. So good. 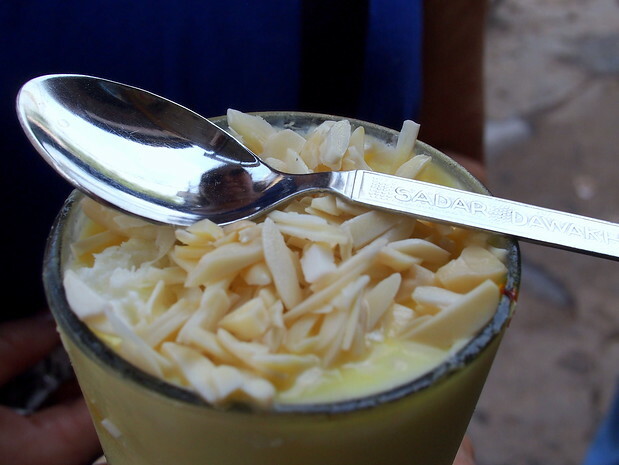 I’m writing this from Montreal, dreaming of paneer (cottage cheese, usually cooked in a rich gravy of cream and spinach or spices) and lassi (shaken yoghurt, served either sour or sweet) and so much more. 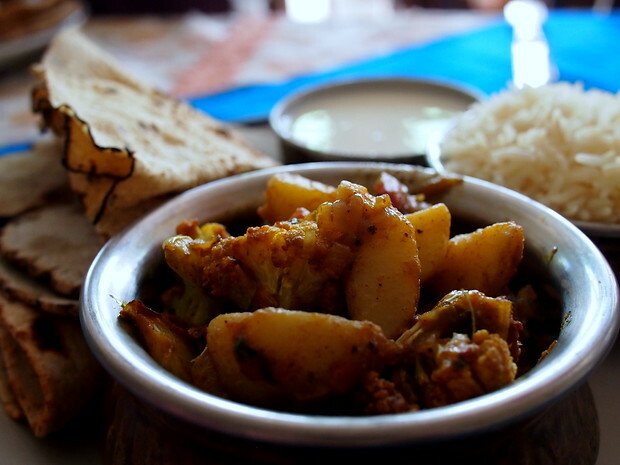 Aloo gobi, potato and cauliflower curry, with rice, yoghurt (“curd”) and crispy lentil crackers (“papad”). Street meat, Jaipur. To those who said “don’t eat street meat” — this was a halal place next to the mosque, freshly cooked & seriously delicious. AND WE DID NOT GET SICK. Win. 2. The Indian head nod. I have no photos of this, but the Internet does, of course, have a GIF. 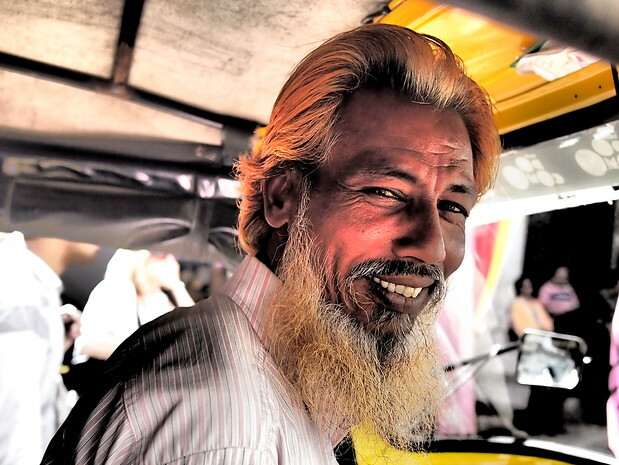 The head nod or head shake or “Desi-nod” (as the label might be) is well-documented in travel blogs and magazines alike. There is a whole section of the book Shantaram about it, how the nod can mean yes, or ok, or no, or a mere acknowledgement of your presence. And it never, ever grew old. From little kids to auto-rickshaw drivers to people in hotels or market stalls, it is a minimalist affirmation of whateverness, and it is glorious. 3. Kids (or their parents) wanting photos. 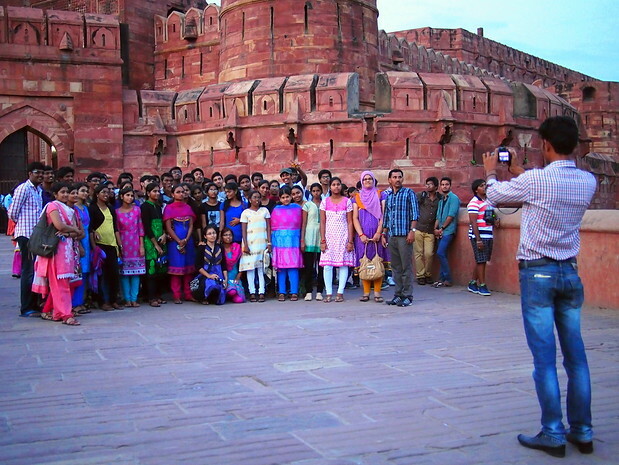 A highlight no matter where you go in Rajasthan or Delhi or Agra: people want you to take their photo. This is a highlight not because of the superficial act of capturing someone else, but because it creates a temporary but immediate bond between you and that person, usually resulting in some serious giggles. From tiny villages to bigger cities, kids would run up and ask for a photo, then ask to see it, then give me a thumbs up or a high five and then disappear. My memories and my photos are full of these sequences, not just from kids but their parents, equally excited to see their kids on camera. THE CUTEST. Red shirt guy in the back too, even though he is too cool for this gathering. 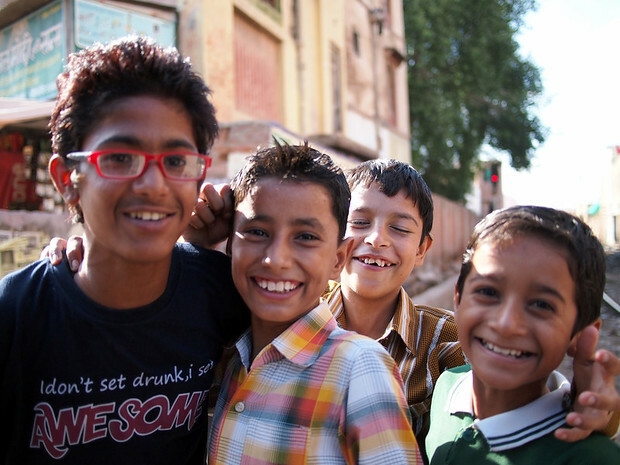 I paused to take a photo in Bikaner and out of nowhere these kids came skidding to a stop, asking to be photographed too. This beautiful woman also asked to take a family portrait, though her son seems less enthused. 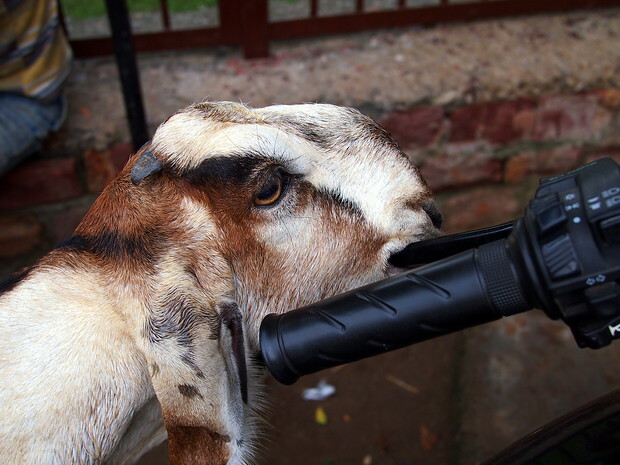 Those who have travelled with me know that I get irresponsibly happy around goats. In Jordan I had a group of baby goats following me into the desert, in Mongolia I stopped the car consistently to take photos of the goat-and-sheep grazing herds and in India I was extremely happy with the amount of goats in the county. Goats might not make a “great” list for everyone but they did for me. 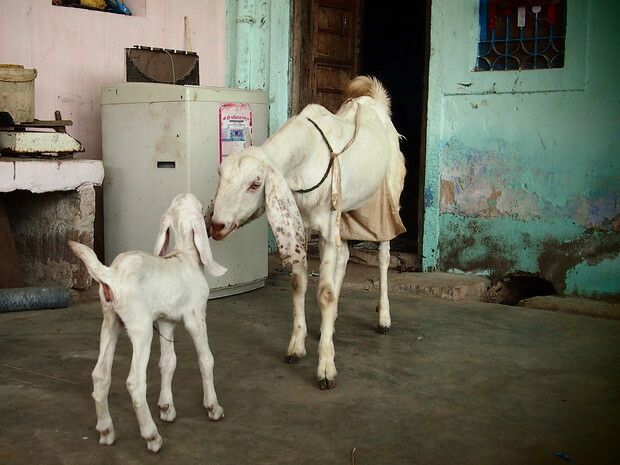 Mama goat (WITH DIAPER!) and baby goat. 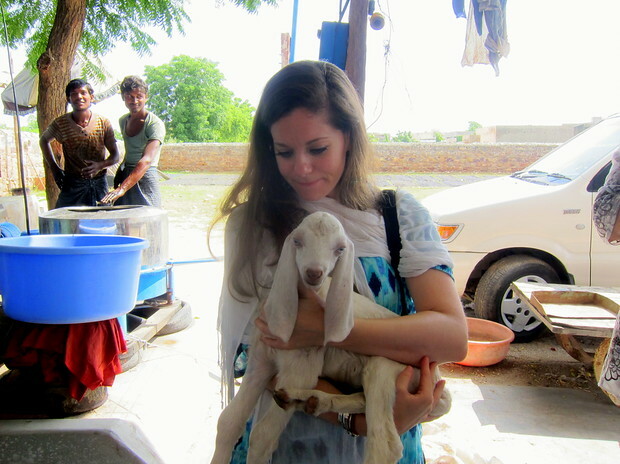 Someone very randomly handed me a baby goat in Chandelao, which I returned to its mother immediately. I grew up helping the farmer across the road from my dad during haying season weekends, often disappearing into the barn to stare at the cows. 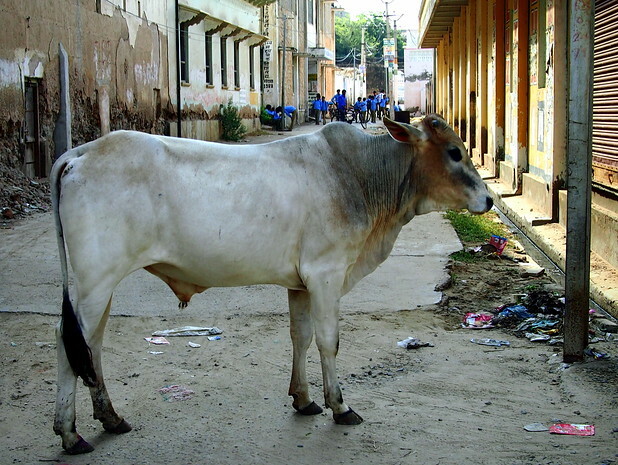 I suppose it is no surprise, then, that I would not take issue with the volume of cows in India. 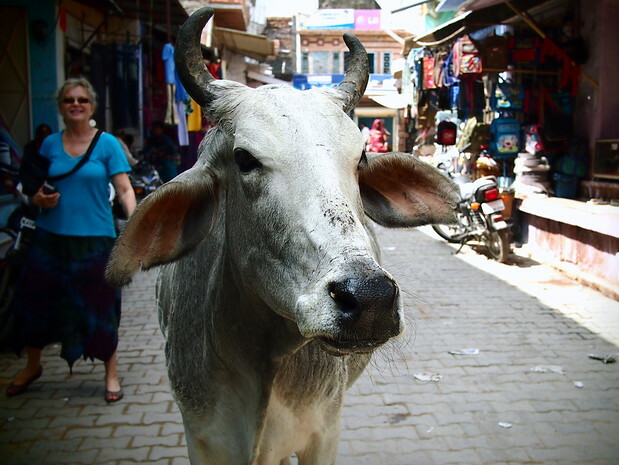 I will be posting a photoessay of cows — how could I not? — but cows get their mention here, as they were all incredibly different. From the calf whose ears we scratched in Jojawar after dinner to the bull who made a run for us in Jodphur, dodging cows was an important part of our trip and definitely added some interesting narrative to our dinners. 6. Women and girls asking tons of questions and wanting photos. Asked to join a portrait with these two women, of course I said yes! Another photo request from an accounting student in Udaipur. 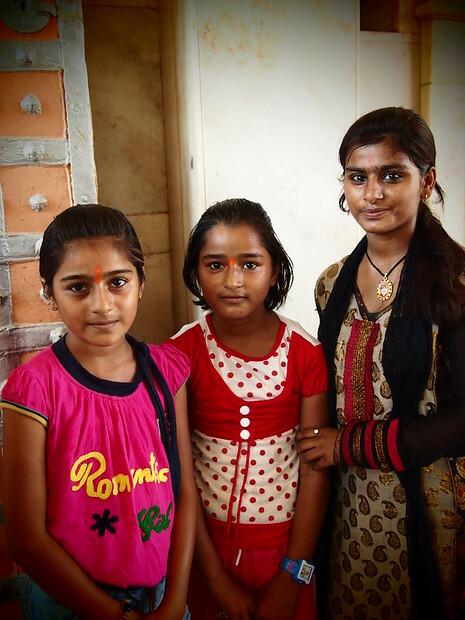 Girls at the rat temple near Bikaner. I am a city person. I love Saigon because of the frenetic energy and the inevitable push to keep your eyes ahead, searching for the next wonderful thing to eat. India was also frenetic, and chaotic. For those who don’t like cities, I’ve been told the South is a bit less chaotic — I have yet to visit, but this was the advice I received. For those like me who take energy from the bubbling mess of noise and movement, you will enjoy Northern India. From Delhi to Jaipur to the night markets of Jodphur, all of the whirring and yelling made me feel like I was in a stop-motion video of my own, standing still while everything and anything swirled maniacally around me. If that sounds like a nightmare, you’re not alone — my mother wasn’t so thrilled with the chaos herself. 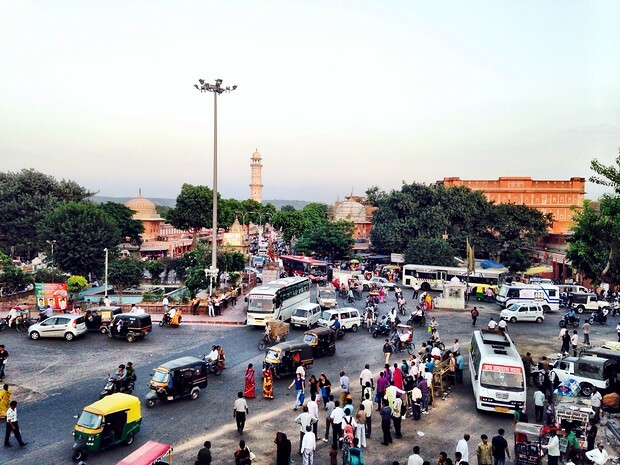 Jaipur during rush hour: rickshaws, auto-rickshaws, buses, people, motorbikes, yelling, honking, cows bleating — chaos. 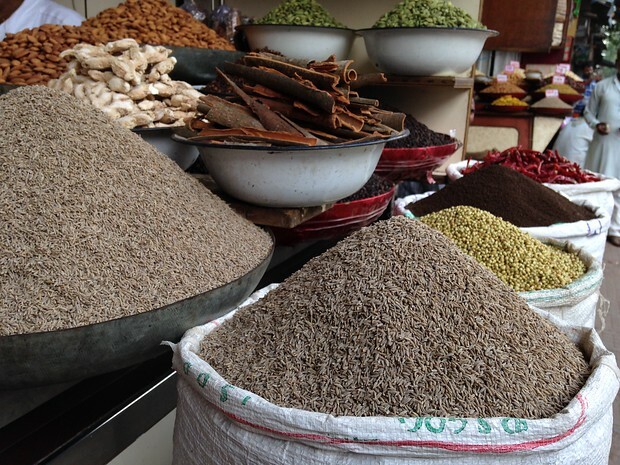 In my Ode to Spices post I wrote about why spices mattered to me and how they were a gateway to eating richly, despite a diagnosis of celiac disease. 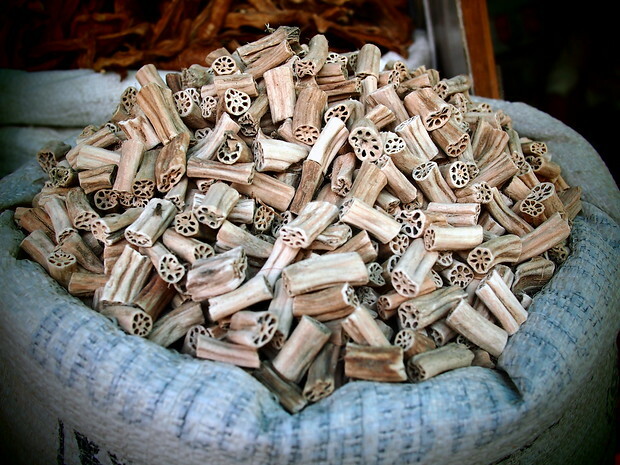 India is ground zero for spices and herbs and dried flavourings, and I in no way got my fill during my short trip there. 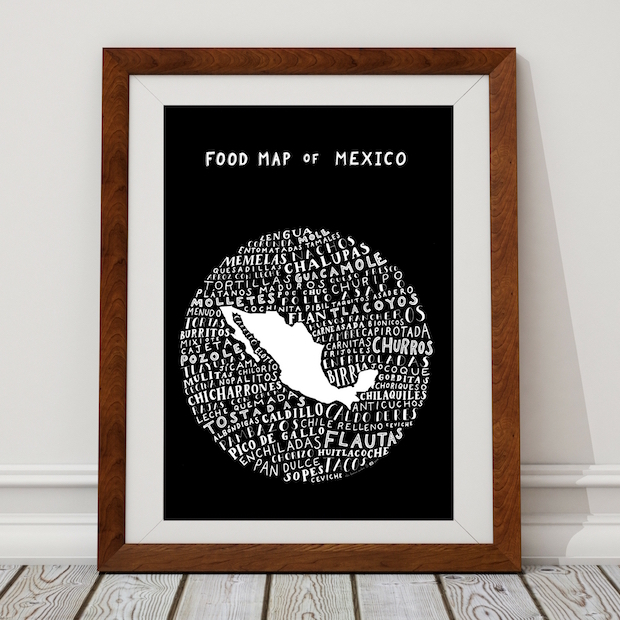 So much more to explore and taste and learn. 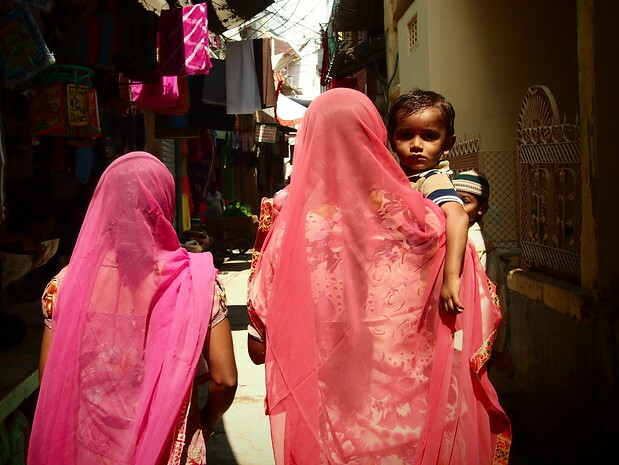 Against the dusty landscapes and neutral sandstone and marble, saris stood out. Though the type of sari differed depending on the city, the vividness did not fade. It made me look at my wardrobe and sigh — what is with all the black I was toting around? From embellishments to simple veils to more elaborate matching pieces, they all stood out as incredibly beautiful. 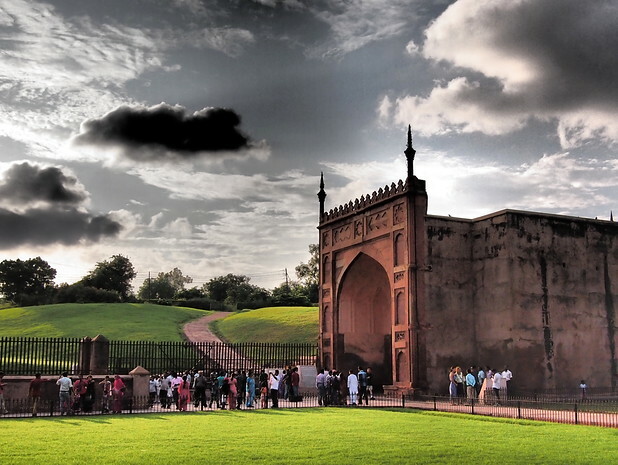 I’ve said this to others but I want to repeat it here: in the face of the most complex, intricate architectural wonders, one cannot help but think “damn, my country is so young.” That’s what comes to mind when I see the forts and gates and Mughal mosques, the palaces and havelis and winding walls tracing the tops of hills. 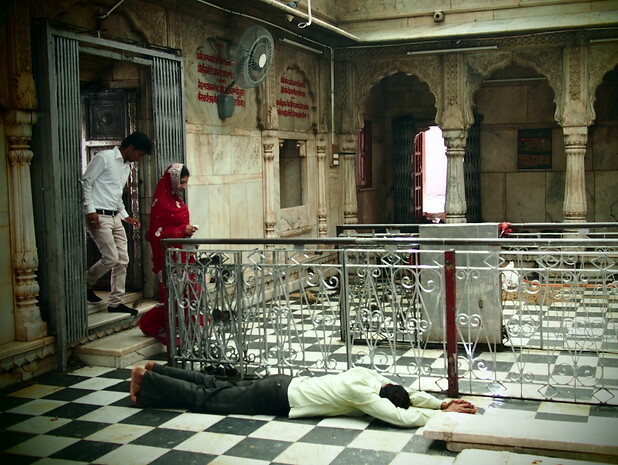 If anyone wants to be reminded of the immediacy of the present, go to India and open your eyes. It will make you feel teeny tiny in the grand scheme of things, within seconds. While the Taj Mahal is the most famous of the places we visited, the sandstone forts, glowing red, were what stood out to me. Caught in the last hours of sunlight they were impossible to miss, impassive and impressive, a testament to their necessity (keep people out) and constructive skill. I only visited the North, of course, and other parts of the country have different architecture. 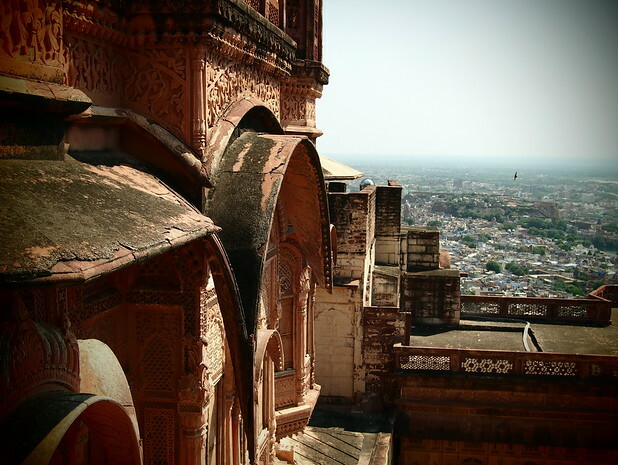 But from now on when I think Rajasthan my mind will immediately leap to ochre and archways. 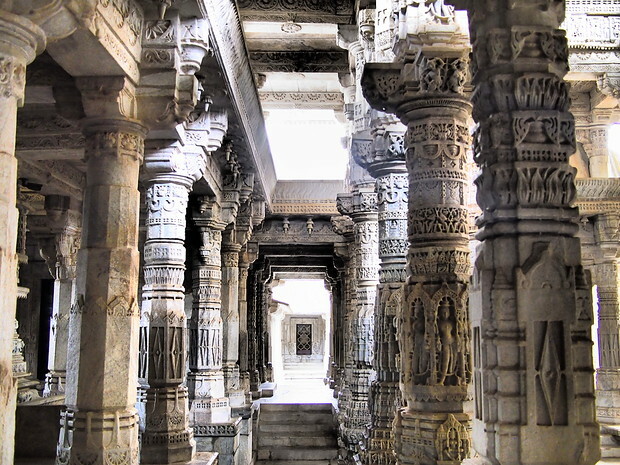 Ranakpur, an intricate Jain temple carved out of marble near Udaipur. 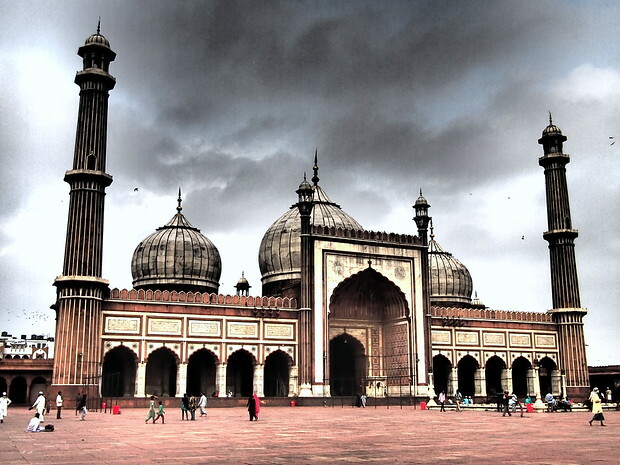 Jama Masjid from the front. 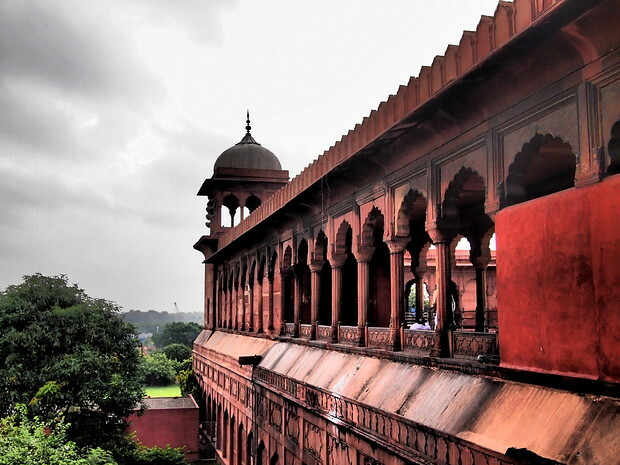 Agra’s red fort from the side. 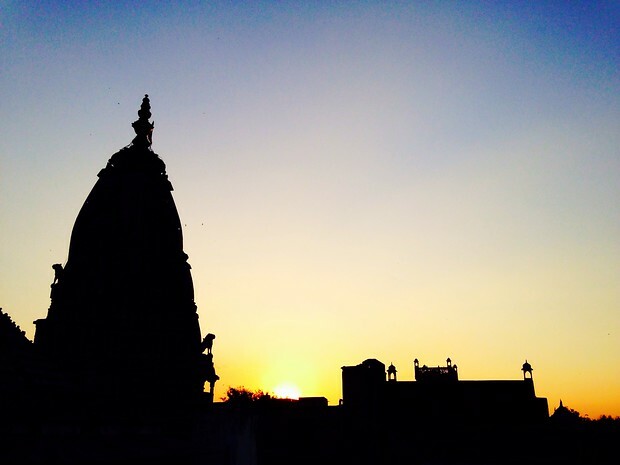 Udaipur’s central Hindu temple, right in the middle of town. 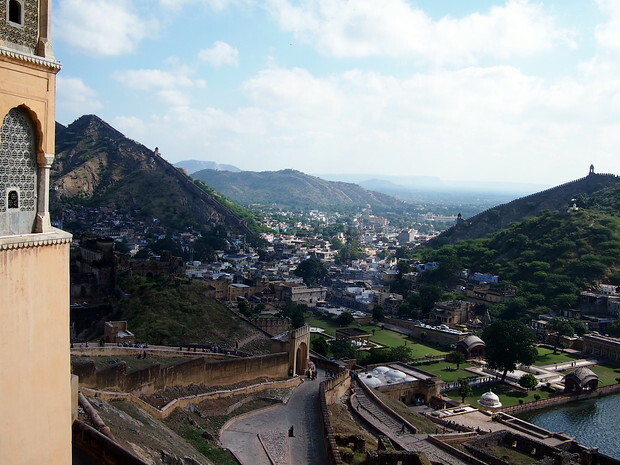 View from the Mehrangarh Fort in Jodphur. 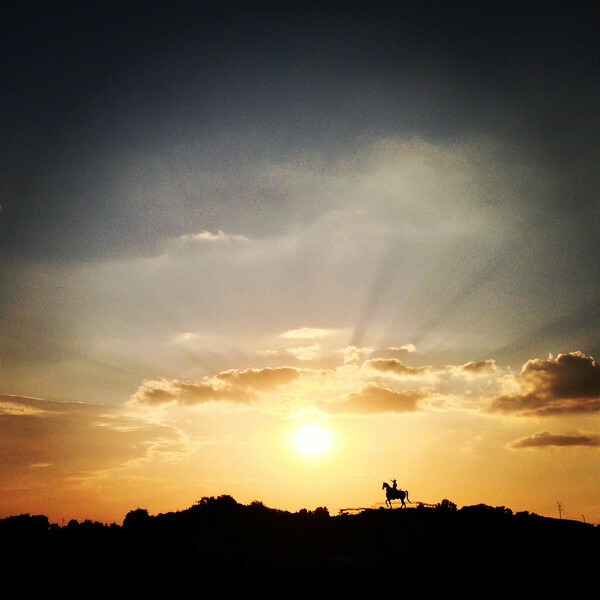 Fact: sunsets are better in far-away places. 12. Moustaches (and hennaed moustaches and beards). When I first arrived in India, readers (both Indians and foreigners) left comments on my fan page about the food, urging me to pick up some of these magic green pearls. Made from concentrated mint and herbs, they are meant to be taken after a meal to alleviate upset stomach and heartburn. And they work, oh boy do they work. By the end of my trip I had everyone around me hooked on them. As one of my readers noted, “you will burp up mint instead of curry”. Even if your stomach is upset, this is a great way to end a meal. And, they are on Amazon! At $3.54 for 10 pearls, a lot more expensive than the $0.24 for 10 in India. Still, I can’t complain — this stuff is magic. 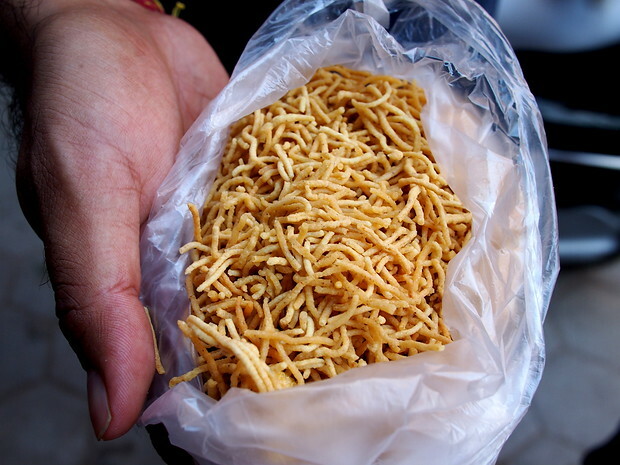 Fennel seeds, called saunf in India, are served after a meal with sugar, sometimes coated in sugar and other times in a bowl like the photo below. Occasionally they are in packets with rose petals and anise seed and fenugreek too, adding an additional punch of flavour. I grew up with the after dinner wintergreen mints, those powdery pink disks that were found in a bowl in front a restaurant’s cashier. Why do we use wintergreens when we can just use fennel? The fennel settles your stomach, gives your mouth a fresh liquorice burst and is simple, so simple. I came back to my mum’s in Montreal and immediately drove to the bulk store to get a big bag of fennel. Paired with those Pudin Hara tablets, I’m guaranteed minty, anise-y goodness for months to come. 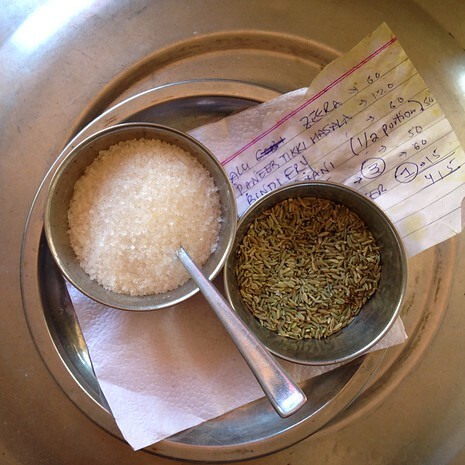 Fennel and sugar in India, along with our bill for a 4-person feast – 6$ total. 15. Hangsies with my mum. The last time I took a trip with my mother was when she visited me in France. I was living there to study, doing a masters in Aix-en-Provence. We rented a car and we drove and drove and drove — 2000km total in a few weeks time, looping up toward Paris, to Arras, back down to Provence and through the winding hairpin curves of Eze and Gordes and other tiny towns. The trip was beautiful but it was a logistical nightmare; I insisted on driving, we got lost a lot and we often ended up negotiating those curves in the dead of night. This time the logistics were out of my hands, and though I snuck my mum away to eat street food when I could, we were taken from A to B without my input — possibly a good thing. After all, years of travel aside, I tend to leave things to the last minute, which doesn’t make people comfortable. When asked, my mum says she liked India more than she expected to. She will write something herself, but overall she had a great time and did not once get sick from the street food. Moreover, we got to spend time together for 3-weeks straight, she celebrated her birthday in Bangkok, and she got a glimpse of what my post-law life is like. She has always been supportive, but also remained a bit baffled about how I met people, how I ate and what I did. 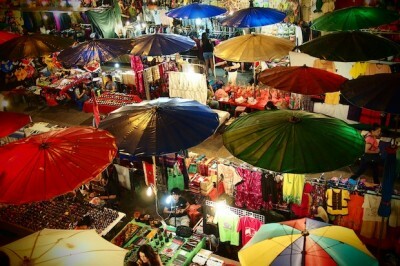 These weeks in India and Bangkok gave her far more input into those choices, which benefits all of us in the long run. 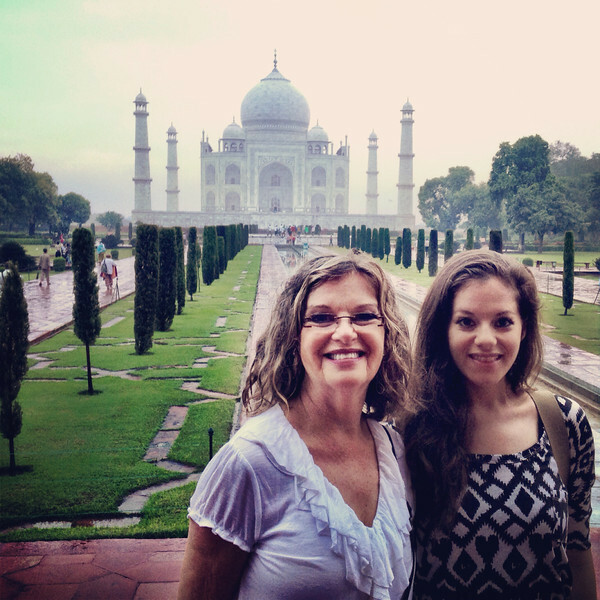 My mum and I at Taj Mahal, in the pouring rain. 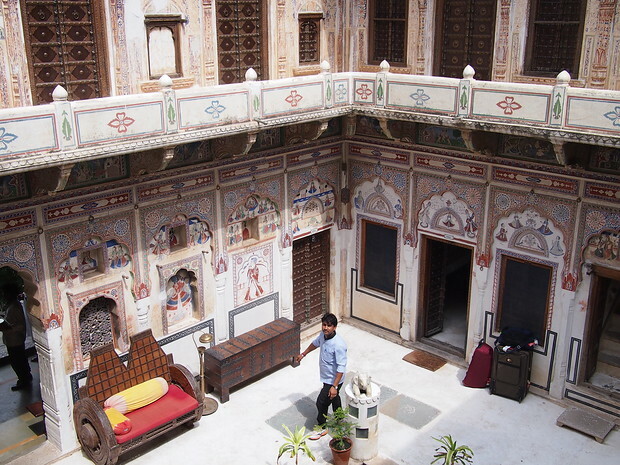 Because of the trip we chose (Land of the Maharajas), we ended up staying in older heritage guesthouses, called havelis, instead of hotels. 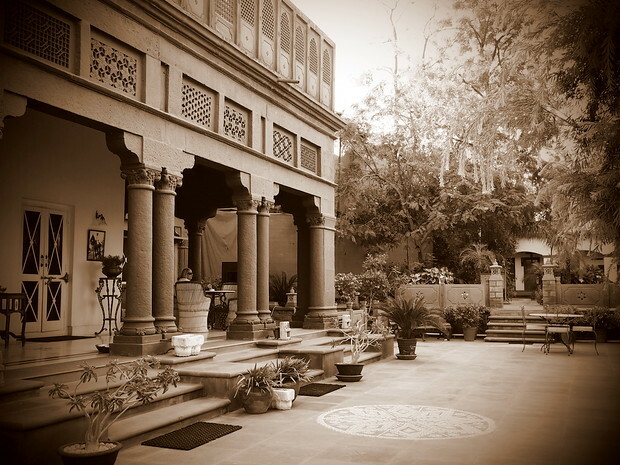 This meant on one hand that we were isolated at times and with no choice for food — though happily these havelis had chefs that not only made great meals, but let me into the kitchen — but also that we were staying in places rich in history. Each had a story, and someone to go into that story and how India and its property ownership has changed over the years. While not a full picture — it was just a few weeks after all — the heritage houses and their accompanying narratives made the trip more personal for me and for my mum, a historian. 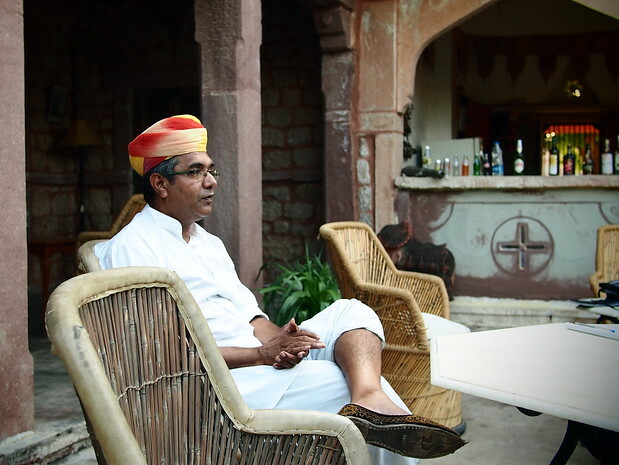 Mr. Singh, the owner of the haveli we stayed at in Chandelao, telling us about the history of his home. I made the mistake of calling these tuk-tuks on Instagram and was quickly reprimanded. 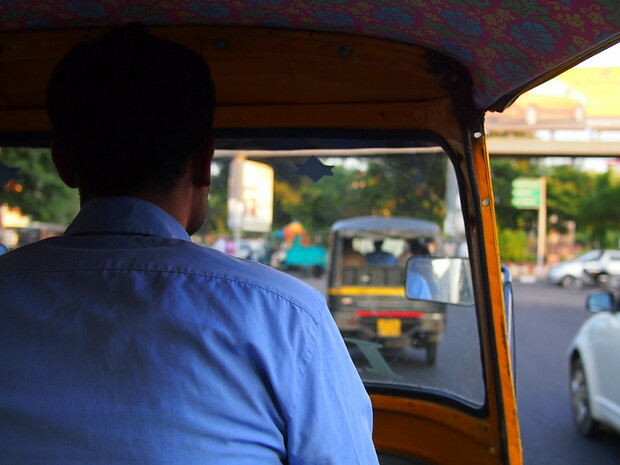 Auto-rickshaws, the tuk-tuk-esque machines that carpet cities in Northern India, are the taxis you always wanted but didn’t know existed. With raucous drivers, hilarious editorial and — as expected — some serious haggling needed to get the price you know you want, they were a lot of fun. 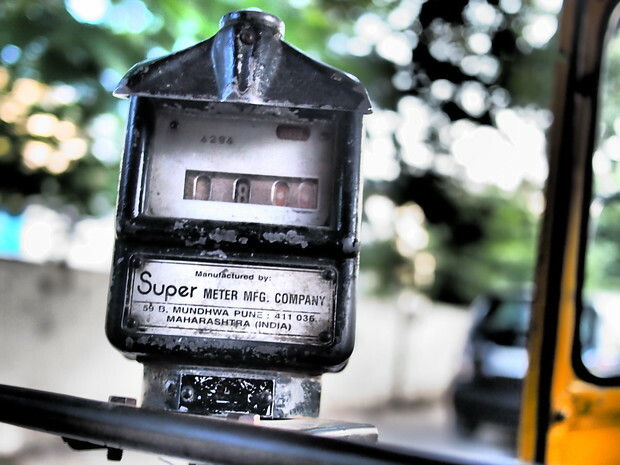 Auto-rickshaw meter — AS THOUGH IT WAS USED. Ha. Never. 18. Chilli and lime to ward away bad spirits. 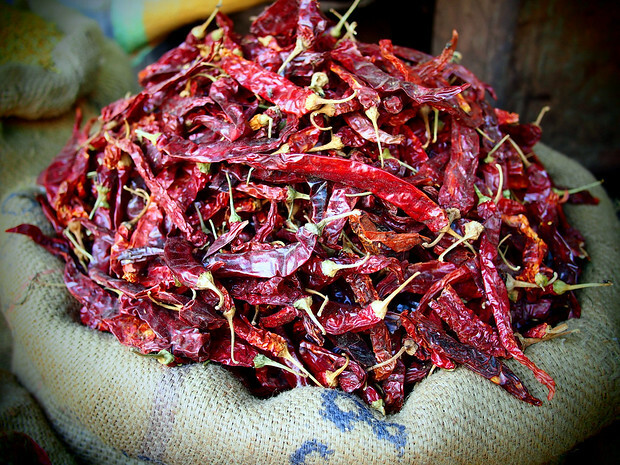 Like the blue nazar boncugu in Turkey, chillies and limes are meant to ward away evil. 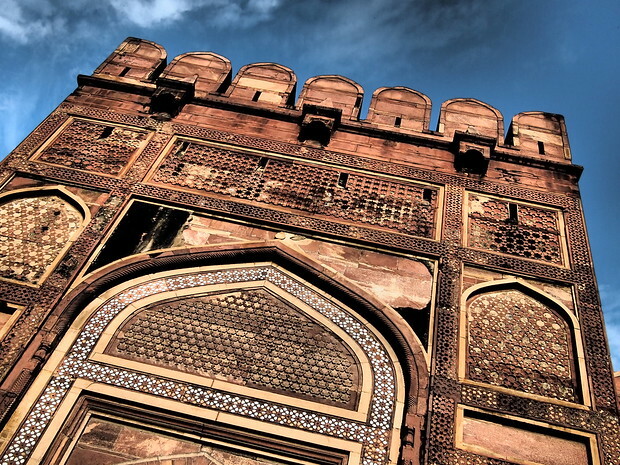 Strung vertically and occasionally plastic, they were found hanging from the grill of trucks just above the ground, over doorways in havelis, over awnings in shops and on the rearview mirrors of cars and buses. A totally unexpected quirk, once I noticed them I started seeing them everywhere. Chilli and lime to ward away evil spirits. 19. Visiting Northern India during a national holiday. We were in town during Navratri, a 10-day festival that culminates in a big celebration called Dussehra. 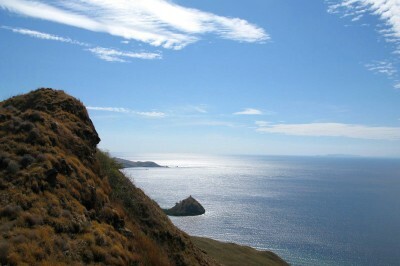 As a result, much of the area was on holiday. 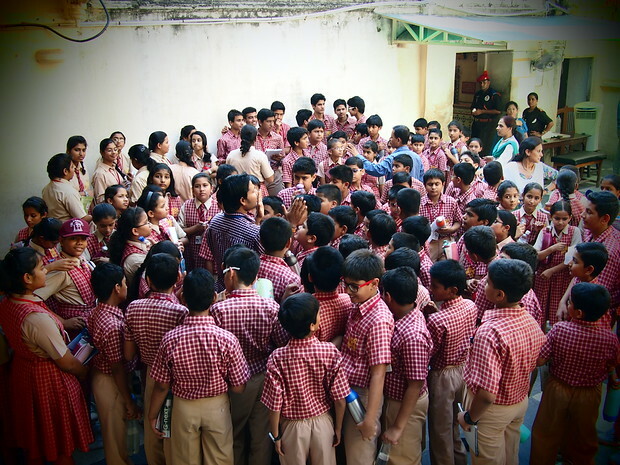 This meant that not only were we visiting Indian shrines and temples and monuments, but so was just about every school child in the vicinity. 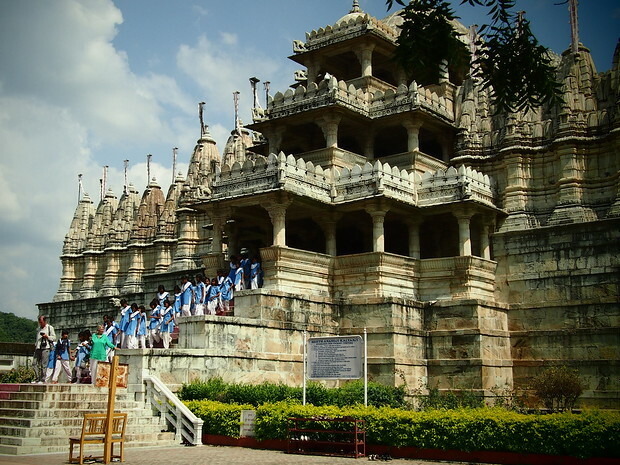 It made for great interaction with curious kids, the opportunity to photobomb a class portrait (and get scolded for it by the teacher, while the students laughed in the background) and watch Indian tourists visit their country’s own famous places. A lot of fun. Class students and the poor guide in the middle at Udaipur’s palace. 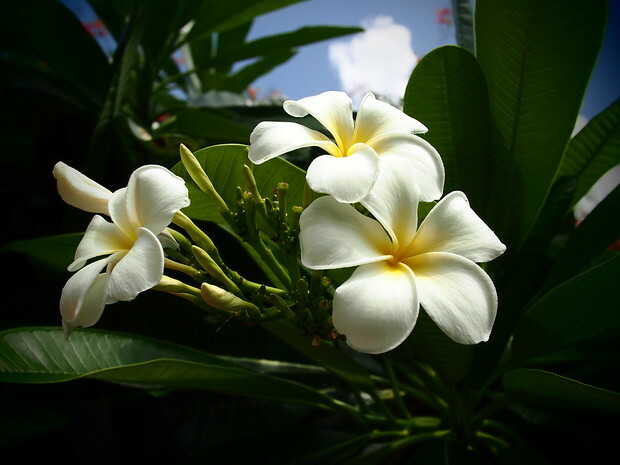 They smell fantastic and they are just about everywhere in Northern India. No complaints. Chickpea flour treats, seasoned with cardamom, chilli and other spices and served everywhere from Bikaner to Jaipur to Delhi, both in bags and — as you can see from the photo below — in bulk and by weight. As a celiac these are safe for consumption, and spicy as hell. Loved it. 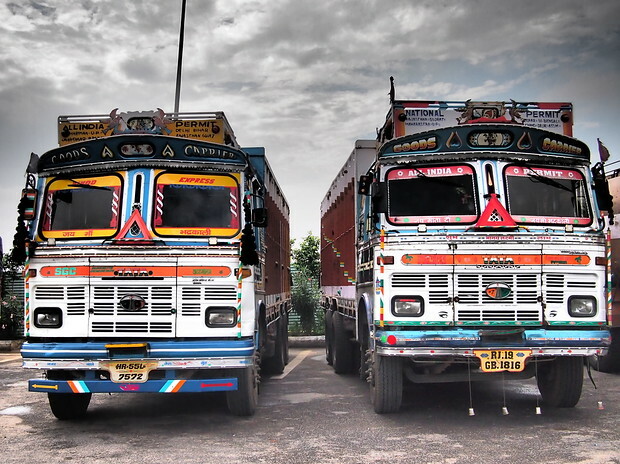 Like jeepneys in the Philippines, Indian truck drivers take decorating seriously. Two of many different colourful options from the trucks in the north, below. A few things that lingered were less positive than the list above. 1. Effects of tourism gone wrong. 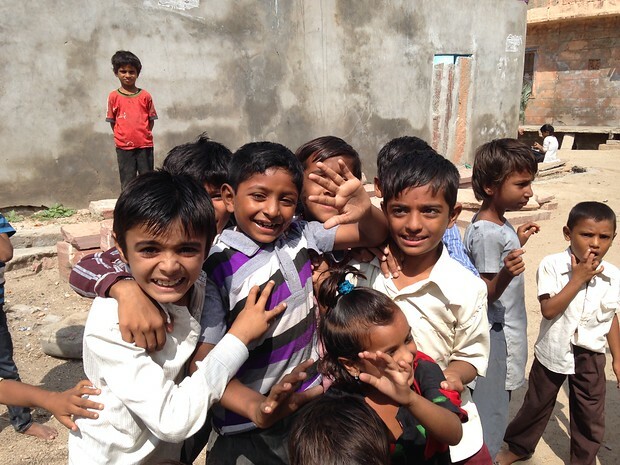 In a few of the smaller villages, the children would come up and ask for photos and just sit and stare. In some where tourism has grown in recent years, however, they would either come up and say “boom boom?” while making lewd hand signals, or ask for money, or ask for pens, or ask for chocolate. As with any developing country, I don’t bring any of those things — if I want to buy pens, I go to the school and ask how I can contribute supplies to the school directly. Candy, no — those teeth are important! But this is from years of travel and reading and of course sometimes the things we do that we think are good, or make a positive impact, can do worse when we leave. I’m not pointing fingers at any one group or tourism generally, but it does make me sad when people don’t think about the effects of their so-called generosity after they’ve left. Also, what’s with sticking your camera in people’s faces? It’s one thing to have someone come and ask for their portrait to be taken, or for you to ask them first. It’s another to do what this woman did, just walk up and shoot a photo and leave. Not ugly in a “can’t they go somewhere else?” way, because I know full well there is a serious lack of public toilets. I, too, had to pee often and had trouble finding a place. (Perhaps I’m just jealous that dudes can pee anywhere they want?) Either way, every time I turned around, there was a guy peeing. The photo below was me trying to capture the railway tracks. I had no idea Peeing Man #24523532 would be captured too, as I didn’t see him. But there he was. It’s not just India. The same goes for Vietnam — there was a tree near my old apartment that we referred to as “The Peeing Tree” — but it’s still an “ugly” merely because of the stench and the risk of coming into contact with peeing dudes at every turn. Again not limited to India, but in a country with so many people it makes sense that there would be an exponential amount of waste. Plastic bags are no longer allowed in Delhi (soft fabric ones were given instead) but the garbage, oh the garbage. Piles and piles of it, sitting on the ground. 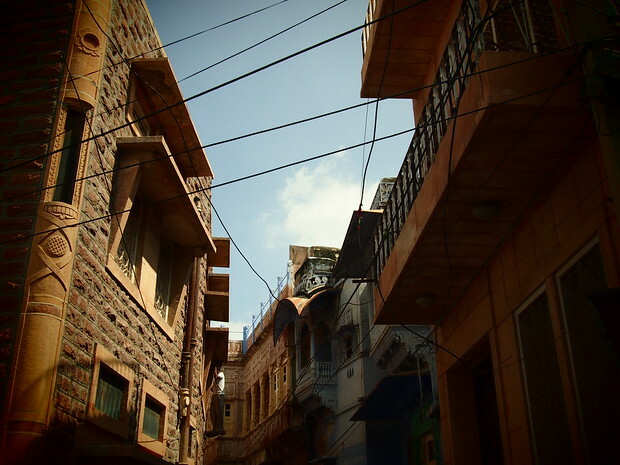 In Chandelao, the owner of our haveli got into a heated discussion with townspeople when they wondered why I wouldn’t dispose of my plastic tea cup on the ground, explaining that it would just create more dirt and potential problems. They genuinely fought him on his arguments, not seeing the problem. That’s quite common in other countries I’ve visited — e.g. the woman on the train in Myanmar who waited to throw her styrofoam out of the window in the country, because “people won’t see it”. (She had no idea it would never biodegrade.) I don’t have solid answers (education about lasting effects of plastic is a good start, and I know that is being implemented), but garbage definitely merits mention because it is so un-ignorable. A lot of cows means a lot of cow dung. Enough said. Ah, the touts. We were warned, of course, and we were for the most part sheltered from them since we were part of a tour. But in the bigger tourist centres, anywhere in the world, you will find aggressive salespeople and you will be exhausted by the end of wading through them. Everyone needs to make a living, of course. 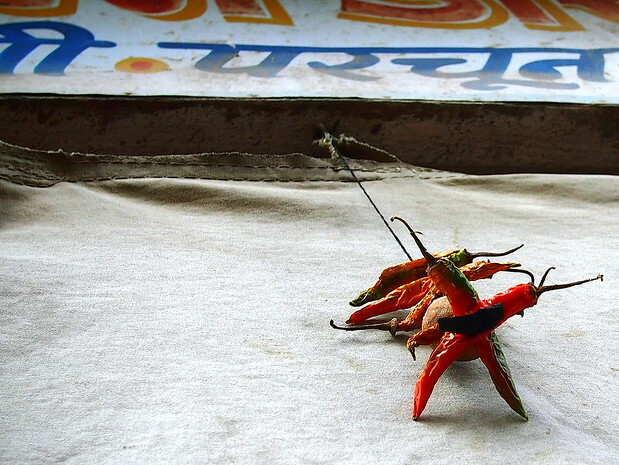 But India’s touts, notably in Agra, were more aggressive than I had seen in other places. I was glad to visit the rat temple but I was not glad when the gentleman behind me kept flinging rat food on my bare feet so that the rats would come and scurry over them. NOT COOL, RANDOM MAN. Not cool. 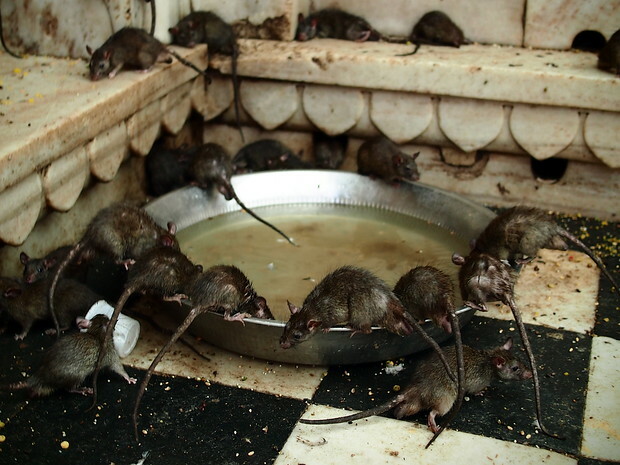 The temple, homage to Hindu sage Karni Mata, is filled with thousands of rats. Smaller than what we are used to in North America, they resemble field mice with scrawnier tails. 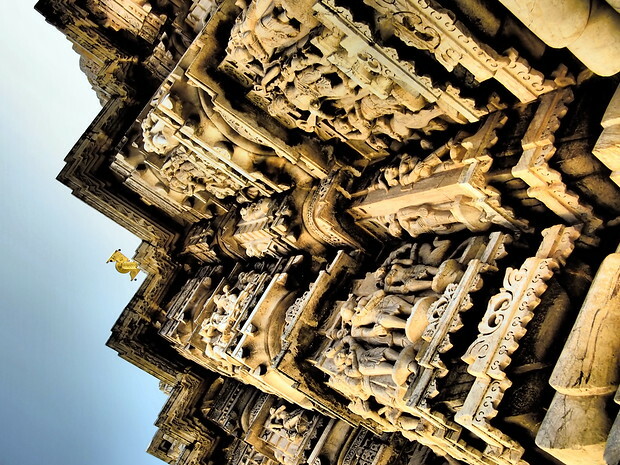 The temple was built in the 1900s and was filled with pilgrims who were coming to pay homage to Karni Mata in the hopes of prosperity and health. No shoes are allowed in the temple so I had a pair of socks that I quickly discarded upon leaving the premises. I’m not afraid of rats, but I have to say that in the thousands they just don’t feel so cuddly. 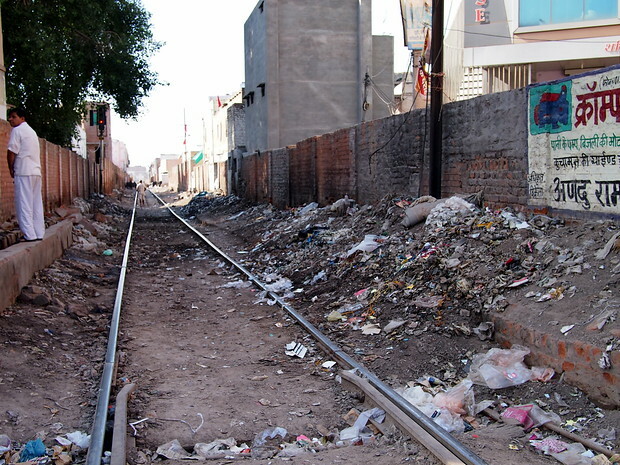 It was a fascinating stop near Bikaner but still gives me the shivers when I think of it. It’s not a rat temple without a closeup. 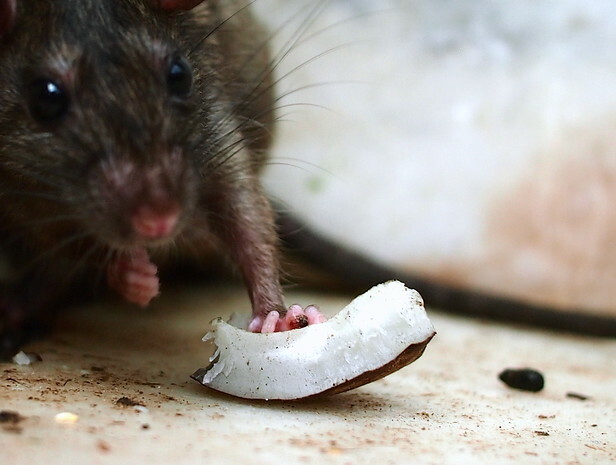 This guy was hogging all the coconut pieces. Monkeys, oh monkeys. Perhaps because I am not large enough to be a threat, perhaps because they know I am not remotely fond of them — regardless of why, they make a beeline for me. 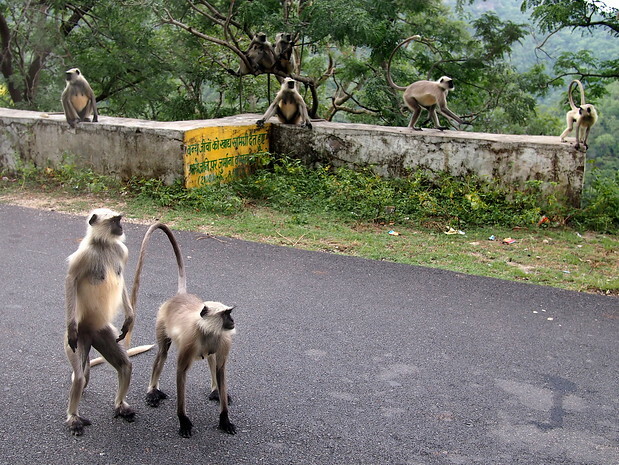 I carry a safety whistle because monkeys have already made me a target, and they’ve also stolen water, dug through my bag for food (though there was none) and thrown away my shoes at a temple. I know one cannot stereotype one monkey for all monkeys but I have to say, not a fan. And there are a LOT of monkeys in India. 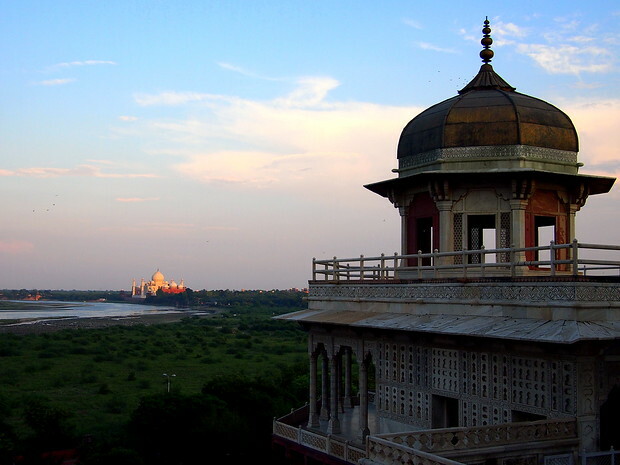 And thus concludes my introductory post for India. Brevity is clearly not my forte. But I wanted to give some overview of the things that stood out, even after years of travel, and the things that lingered. I’ve not touched upon the more contentious issues of gender norms and treatment of women. I did not spent enough time there to speak to those complicated subjects, though I highly recommend people read this smart, researched piece from Amartya Sen. I really love this post. I stumbled across your facebook and came to your website and whenever I see another Travel blogger has been to India I have a read through some posts. I went to India in March and your photos make me so nostalgic. It’s cool that you went with your mom – my mom really wants to go! Hehe, I’ve noticed 22 vs 8, it’s not so bad ;-) You should try to celebrate Bastar Dussehra someday. Not only it’s the World’s longest festival, but it’s also a Tribal one celebrated with the Raja. I hardly find negative points when I travel around Bastar! Wonderfully written. 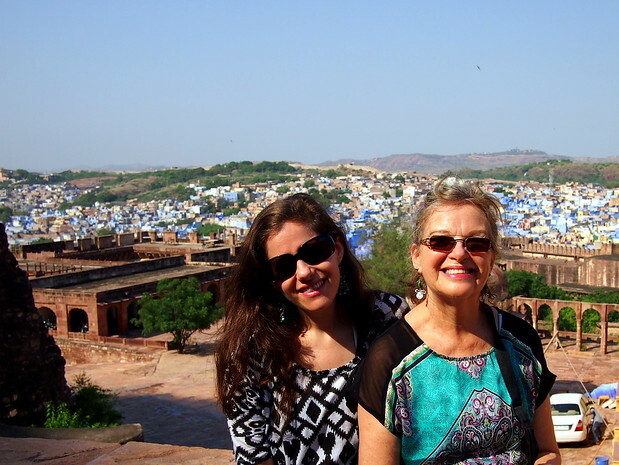 I could retrace and summarize my recent trip to Northern India with my daughter, exactly as you have. Your pictures of people are beautiful. Your trips looks and sounds wonderful from reading. I cannot wait to create my own experiences, thanks again for sharing. 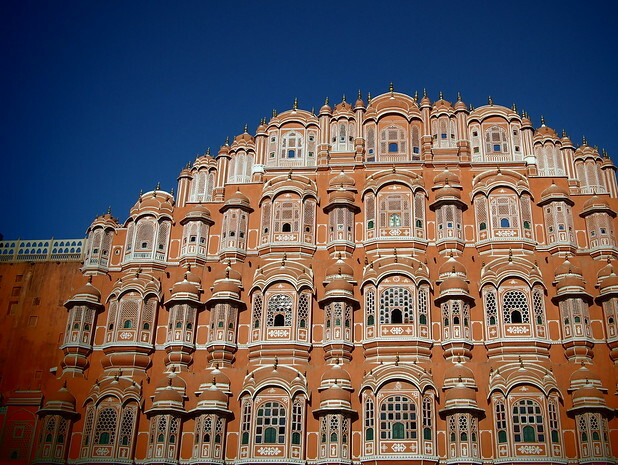 Hi Rosandi, as it was a birthday present for my mum, we booked with G Adventures on their Land of the Maharajas trip. I worked for them at the time as a brand ambassador, and this allowed me to complete the assignment whilst also allowing my mum to feel comfortable. You can contact their sales dept to ask after the Havelis they use. Thank you for reading! Beautiful pics. 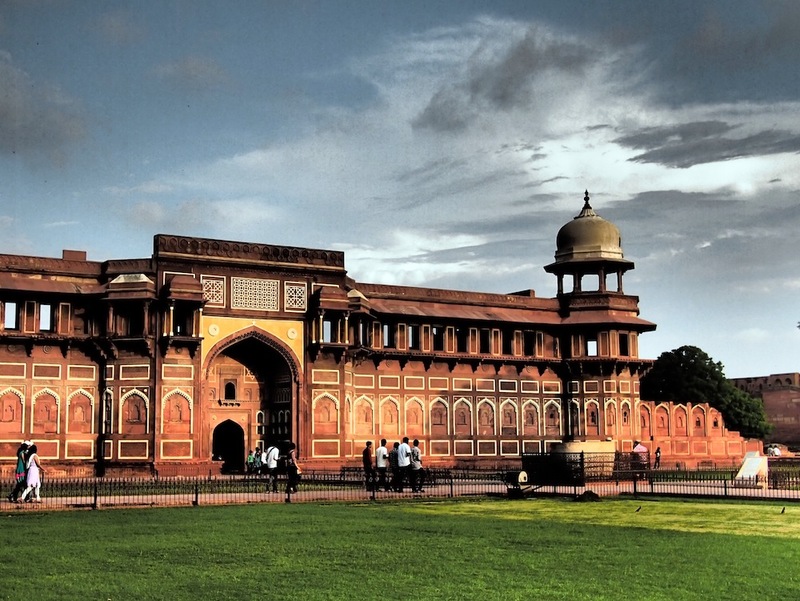 You share the information of northern India is really awesome info. I am reading your blog and i get the useful information. Thanks! Hi! Oooh how I recognize everything in this post! Having spent 6 months in India in 2008, it’s all coming back after reading this. The cows, the colors, even the smells :’) Thanks for making my day with this! Happen to browse by ur blog.. This is a awesome writing.. Really interesting.. Makes me understand India better..